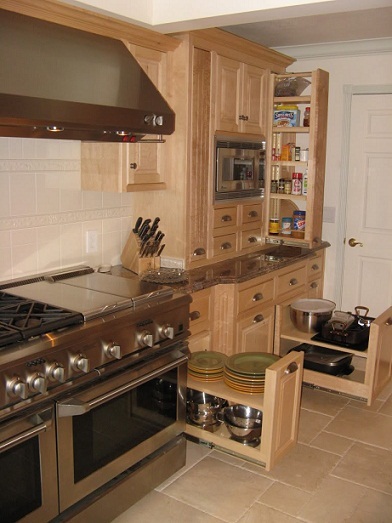 Here are some additional tips focusing on base cabinet pull out storage options to optimize storage space in kitchen base cabinet plans. First, if you have fairly high ceilings extend top kitchen cabinets on the wall all the way up to the ceiling. You won't be able to easily reach items in these kitchen pantry cabinets, however you will be able to store infrequently used items there and gain up to 50% more cabinet space that would otherwise be unused space. Secondly, if you have more cabinet space than you have kitchen accessories to fill them you can have custom made base cabinet pullout drawer inserts installed to perfectly fit all of your belongings. This could include a specially made template to store cutlery or a special collection of serving utensils in their own niches. 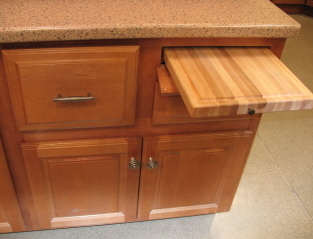 Here are some cutlery and drawer pull out options available for base cabinets. Other base cabinet organizers available: Base cabinet pullout drawers which have dozens of options for compartmentalizing your utensils with options such as cabinet cutlery divers, pegged dish organizers, roll out tray dividers in cabinet shelving, or for corner cabinets a deep bin cabinet Lazy Susan. Hardware for these types of options usually consists of sliding cabinet door hardware. When deciding on base cabinet plans, the options are endless. Most kitchen cabinet manufacturers offer base cabinet organizers with cabinet shelving which rotates, spins or flips behind other shelves. For those whose base kitchen cabinet designs are crammed into right spaces a flip up kitchen cabinet door is also available which helps avoid cabinet doors bumping into one another. Base cabinet storage cabinets have even gone 'super' these days. Shrock kitchen cabinets offer a super cabinet design with interior base cabinet pull out drawers in the middle, interior slide out baskets flanking the drawers on both sides and wire shelves attached to the inside of the cabinet door for ultimate kitchen cabinet organization.